It was a pleasure to see so many of you at the town hall earlier this week. I want to reiterate my thanks to everyone for pulling together this month as our campuses rounded out the spring semester and the Board of Governors came to town for their May meeting. It’s been a whirlwind as we head into the summer, and there’s a lot of work ahead. As I mentioned, our Strategic Plan rollout is coming along nicely. We have a senior staff retreat this week to help map out the implementation phase and how we will work to develop divisional and individual goals aligned to the Strategic Plan in the next fiscal year. The plan will drive much of our work at GA in the coming years—it’s an all-in effort—and I’m excited to work with all of you on reaching the big goals the University and Board of Governors have set. My first attempt at a spring commencement ended in a washout in Greenville earlier this month, but Chancellor Staton and I made the best of it. You can read the address I was going to give—a scholarly take on the wisdom of country music—or watch the truncated, wind-blown version. 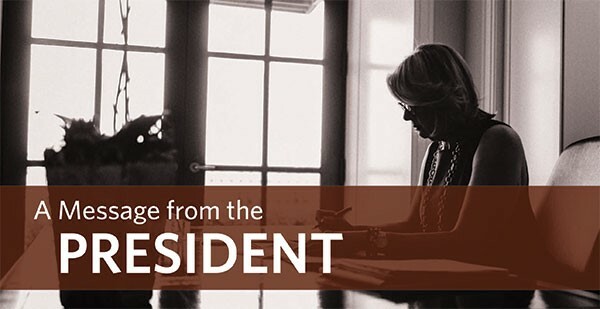 Finally, as many of you know, I was absent last week because my mother passed away (Chairman Bissette delivered the President’s Report at the BOG meeting). Our family knew the end was approaching, and I’m grateful we had the chance to say our goodbyes and prepare. But it’s still hard, and it’s bitter poetry to lose your Mom on Mother’s Day. Thanks to everyone for your sympathies and kind wishes. The University is in the early stages of creating a statewide commission on educational attainment, working to rally the state’s education, business, and civic leaders around a common goal. Following last month’s convening in Raleigh, we held a second gathering at the offices of the Foundation for the Carolinas in Charlotte. Despite howling wind and rain—a theme of this month’s travels, it seems—dozens of people, from early childhood advocates to business titans, came together to build momentum for a truly statewide effort to build a stronger continuum from preschool to postsecondary education. I’m incredibly excited about this, and you’ll hear more in the coming weeks. I was back in Charlotte a couple weeks later to take part in a Bank of America Global Ambassadors Program geared toward women entrepreneurs from across the world. I spoke about how much progress women have made in higher education, and how we still have a lot of work to do in translating that educational achievement into business and political leadership. And at North Carolina Central, I took part in the annual Technology Institute for Educators. It’s a great example of how our campuses drive professional development for educators and school leaders, and I gave a talk about how our country needs more high-tech talent in the public and nonprofit sectors. We’re more than halfway through the budget process, with the Senate completing their work last week and the House picking up the gavel now. There’s a lot to like in the Senate plan—full enrollment growth funding and a big investment in new data systems—but also some disappointments. We’ll be working with the House to make progress on funding for faculty retention and operating costs for the new buildings backed by ConnectNC Bonds, among other priorities. In general, it’s been a very productive session with a lot of good discussion on University issues. Kudos to Kevin Howell, Drew Moretz, and Jonathan Kappler for their work. They’ve still got a lot of late nights and reheated coffee in their immediate futures, so wish them well. And when they call needing information, please make their requests a priority. It’s hard enough to get credit for doing good stuff, and even harder to get recognition for preventing bad things. So a hat tip to Lynne Sanders, Joyce Boni, Carol Harris and their team at Compliance and Audit Services for all that they do to keep us out of the headlines. I want to think of our internal auditors less as a compliance check and more as a proactive resource. Whenever you have questions about rules, risk assessments, or just the best way to go about an administrative task, look to Lynn, Joyce, Carol and the team for guidance. The more we can do to implement best practices on the front end, the better for us all. I always like to include a little light reading that highlights the big issues we’re thinking about this month. As always, keep an eye on our Twitter and Facebook pages for the latest and greatest from GA and across the UNC system. The Raleigh News and Observer and the Charlotte Observer did a fantastic investigative series exploring how high-achieving kids fall off the college track — highlighting the need for good data and a stronger P-16 continuum. My predecessor, Molly Broad, wrote an important piece for the Chronicle of Higher Education on restoring public faith in higher education. It pairs well with a recent New America survey about public attitudes toward college, covered in Inside Higher Ed. David Brooks wrote a fascinating column in the New York Times about the impact of “thick” institutions — places that create a lasting connection with people. Our campuses fill that role for many, and it’s interesting to consider how we could move even further in that direction. Excellent series of Q&As with our 2017 Teaching Award winners. Very cool to hear their perspectives on what makes for a great learning experience. I’ve seen way too many joyful commencement stories to pick favorites, but check out my Twitter feed and scroll down to see a sampling. Our students, faculty, and staff do some truly amazing work on the road to graduation. Thank you all for making that possible. The UNC System Division of Human Resources provides centralized leadership and support to the human resources offices of the 17 constituent institutions of the University of North Carolina System and provides human resource services to the employees of the UNC System Office.